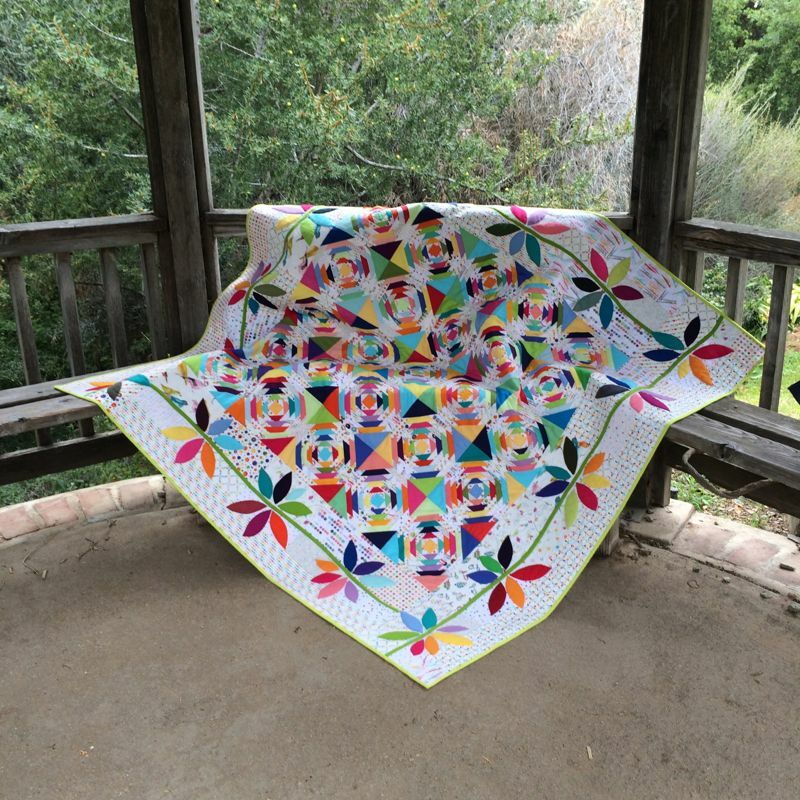 Pineapples and Crowns–Blogger’s Quilt Festival | OccasionalPiece--Quilt! Pineapples and Crowns made it into the Viewer’s Choice section of the Festival. Please remember to vote for your favorite this week! The inner pineapple blocks were made for me by two sets of bees, but the outer border, of the pineapple crowns is all hand-appliqued. I went back and forth between all the categories, looking for the “mixed technique” category, but finally entered it in the appliqué category, if you want to help this quilt become a winner–that’s where to go (*shameless plug*). But, as always, the best thing to call quilts is done, ready for display or enjoyment or to take to a botanic garden and take pictures of them, which I did recently. I love the mix of scrappy white-background fabrics and the rainbow of brights. I placed warm bright petals in the outermost border, and cool petals in the inner border. It’s not really noticeable overall, but I needed to organize these blossoms somehow, and I chose to do it with color. 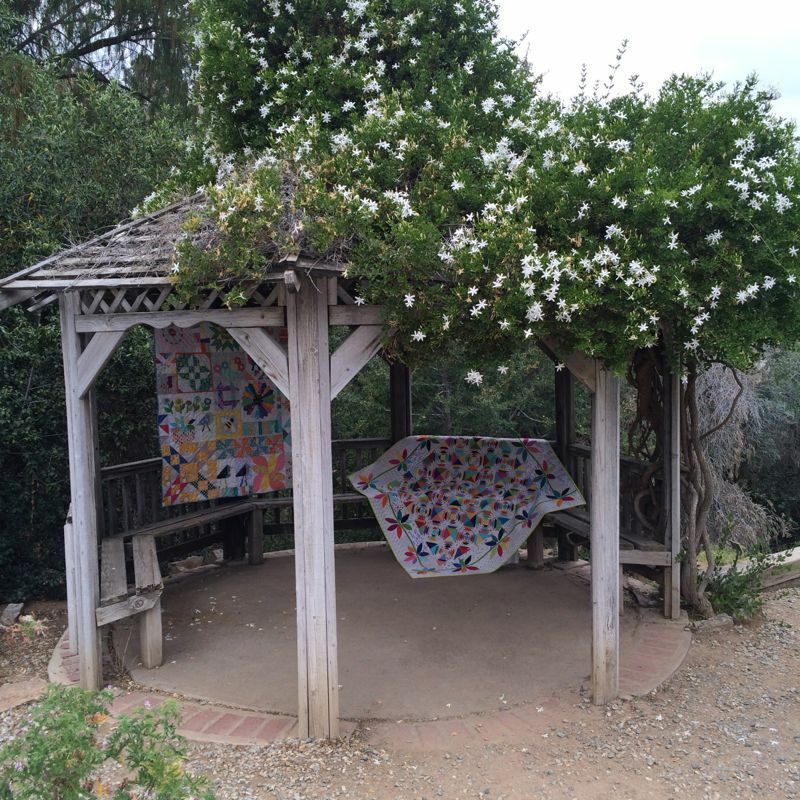 I hope you’ll take a few minutes and head back to Amy’s Blogger’s Festival to see all the other terrific quilts that are showing up there, and to vote for your favorite in each category. The voting begins May 22nd, and you can also vote for Viewer’s Choice as well. 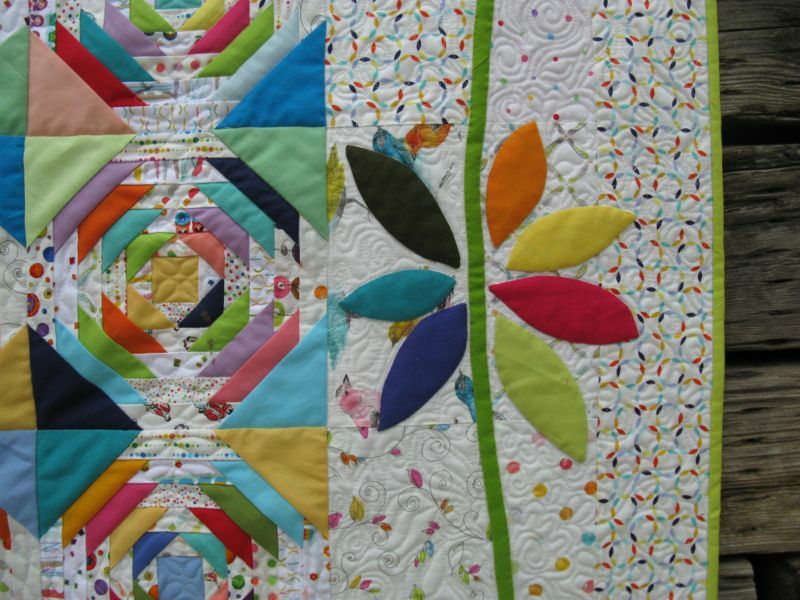 Enjoy the online quilt festival! Just to die for! Wonderful work of art! Beautiful! I love the colors and the varied background. I’m so glad you entered this! The more people who get to see it the better! Beautiful! 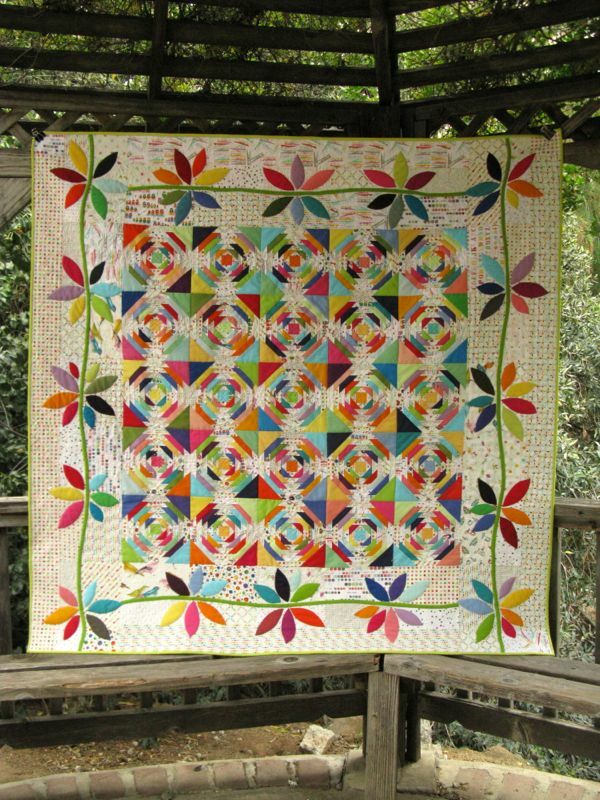 This one (and your lollipop) are probably my all time favorite quilts from the house of Elizabeth. I hadn’t noticed the warm cool color arrangement in the border, but now that I see it I think it really adds to the overall design quite nicely. Perfect. Perfect. Such a beautiful quilt! Thanks for showing it! What an eye catcher. It’s a beautiful quilt. 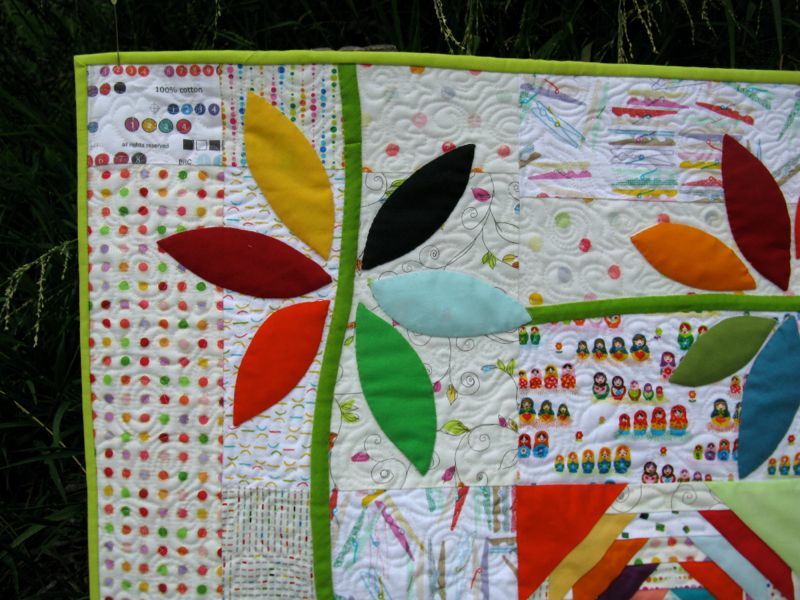 Just got my quiltmania mag and your lollipop trees quilt is on page 28. I am so excited for you. Did you win a prize? That’s fabulous applique on this quilt. I love all the colours, and the trailing vine just sets it all off perfectly. Lovely, lovely quilt! I love the colors and the scrappy background too. Great job! Beautiful, energetic, I love bright colors and fabulous applique! Wonderful quilt! I love it!!! Good luck in the festival!! This is such a beautiful quilt. Of course I voted in both categories!! What a stunner this is! I especially love your appliqué and those borders are so perfect. Well done and best of luck in the Festival! 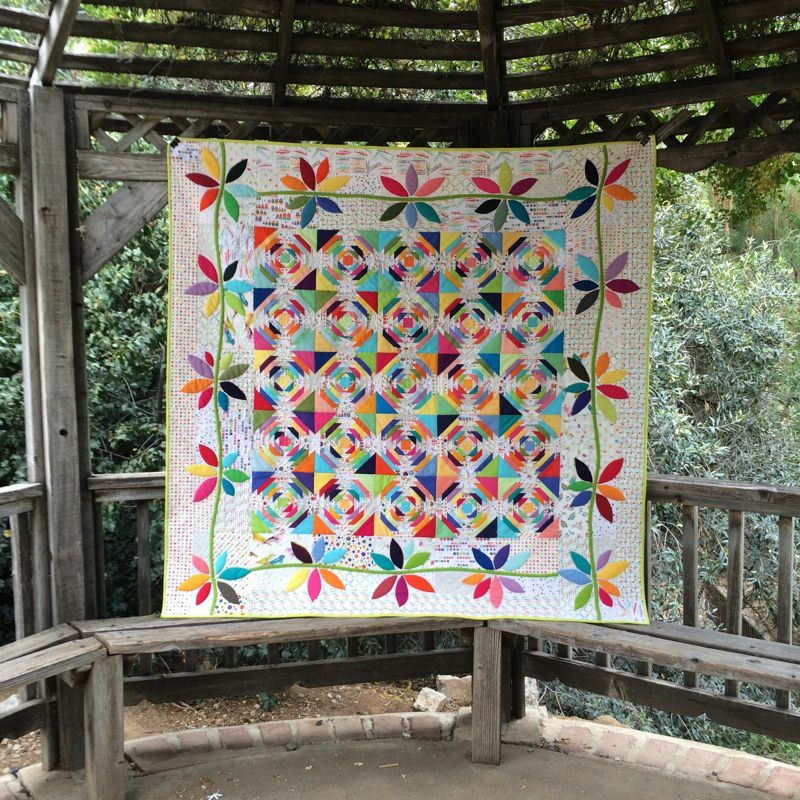 Congratulations on your pineapple block quilt making it to Viewer’s Choice! Well deserved as it’s gorgeous! Really beautiful! Love the bright applique!